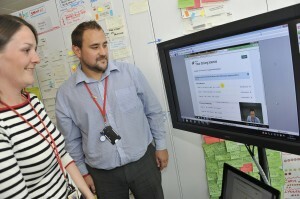 As we get closer to the Beta phase of the 'view my driving record' service, our insight activities are gathering pace. September was another busy month of testing with the public. This time we travelled to Plymouth, and then just a mile or two down the road to our dedicated testing suite at DVLA’s Richard Ley Development Centre in Swansea. Once again we had a great mix of ages and abilities and presented our participants with a wide range of scenarios testing everything from the log-in process to viewing their penalty points. As this product develops we are naturally seeing a decrease in the amount of defects and usability issues identified. However, that’s not to say it is perfect (yet!). 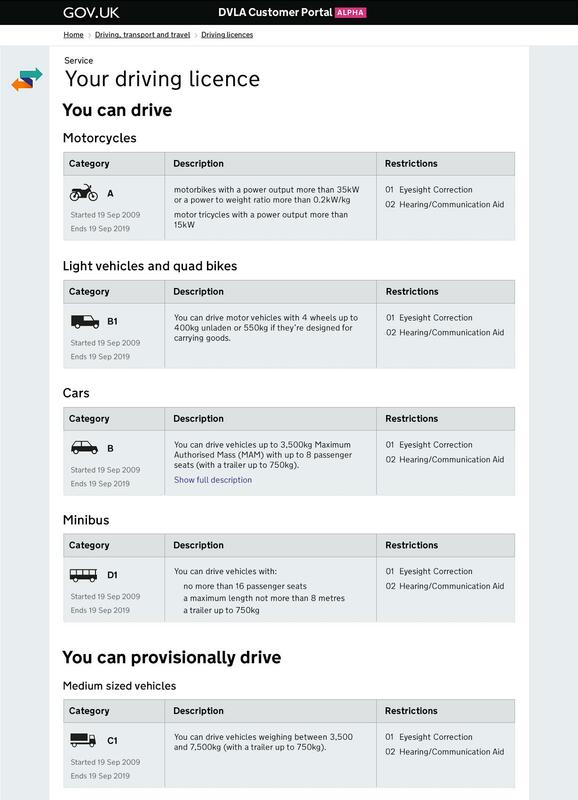 For example, one of the main findings to come out of our previous round of testing in Glasgow was the order in which entitlements (the types of vehicles an individual can drive) are displayed. Participants generally felt that the ordering was not logical as to find if there are any restrictions on driving a car, the first category would expect, they needed to click an additional link. The testing identified that although the link to more information is present, sometimes it is not obvious enough, causing frustration for the customer. In response to this, the developers came up with two different versions of the entitlement screen which can be seen below. All but one of our participants in the Plymouth test and two from Swansea agreed that the table format was the preferred option (Version 2). One of the most exciting developments from the Swansea test was in refining our own processes. We took the opportunity to trial streaming the footage live from the test back to the developers using video conferencing software. After a few teething problems we got the hang of it and were delighted with the results. At one point we had over 25 developers and project colleagues watching the test, discussing the findings and ideas for further refinement remotely and in real time. We feel it is important that we continually try to improve our skills as researchers and remain proactive in gathering insight to support our service development. This will allow us to work in a much more agile manner because no matter where we are in the UK, the service can be refined based on customer feedback very quickly. Having had to find out this information the current way (find my licence, look at the back of it, find out the codes etc) last week, it's fair to say this will be a big improvement. One question, though: will the user need to know their driving licence number, that's a little shorter than War & Peace, to access this service? Hi Robert, you won’t need to know your driver number because there is an option to access using personal details instead. 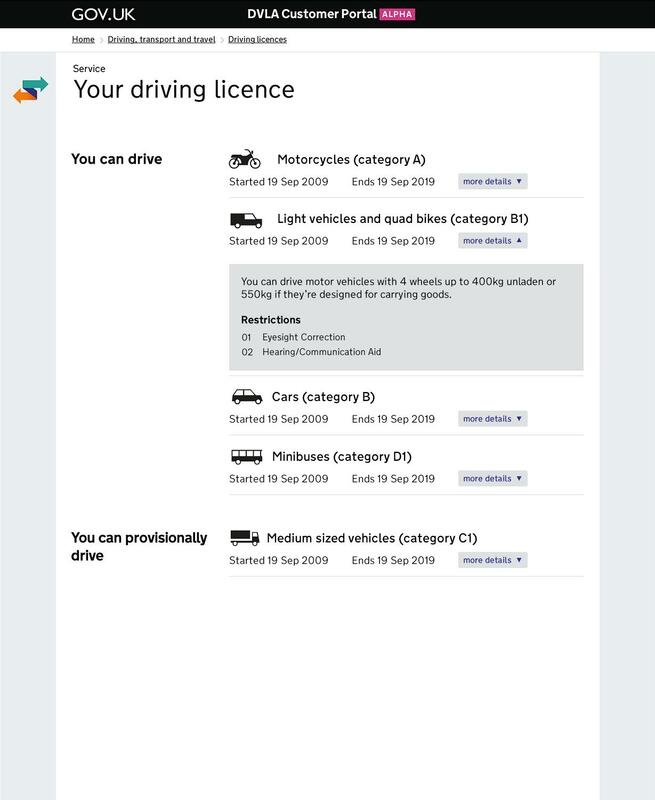 The security around this is dangerous and not clear, therefore knowing someone name, address and date of birth you can access somebody's driving records? Additional validation is provided as the customer must also provide their National Insurance Number to access the service. The customer will not be presented with any additional personal details than were originally entered when they accessed the service. I think the idea is great, version 2 of the system looks good to me! It's more informative and displayed clearer. I could imagine critics would have something to say about security and information online, but personally this system could save a lot of drivers in the UK with all queries and issues! Going online with services is definitely the next step! Would this mean having to give online Insurance comparison websites a lot more personal details such as the NI number which is going along way to giving away even more personal information for possible fraud. The DVLA will be introducing two separate services. The first service will enable GB drivers to view their own driver record online. Drivers will be able to access this service free of charge by providing their driving licence number, national insurance number and post code. The second service will enable motor insurers to obtain limited driver information from the DVLA at the point of insurance quote. The data provided will include driving entitlement and endorsement information. No other personal information will be provided. This will make the process of applying for motor insurance easier as insurance applicants will not need to key in as much information. It will also help to reduce insurance fraud. 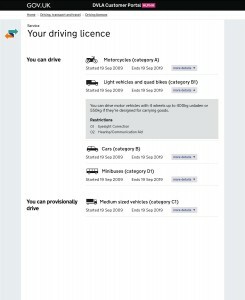 I would like to know if drivers will be able to print the record in order to provide it to their employers to confirm they are still legally allowed to drive. I would also like to know if endorsement can be seen on the online record. Thank you for your comment. Although there is no ‘print’ button on the pages, you would also be able to view endorsement information on your record by using the portal. 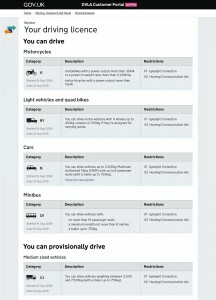 Will "My Driver Record" show the same information even if I still have any of the old style paper licences?